"All these evil things come from within and defile a man." 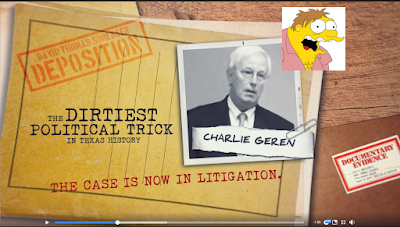 "Did Charlie Geren call Texas Child Protective Services and allege that Bo and Sheridan French were abusing or neglecting their children?!?" "You weaponized CPS for political purposes, didn't you sir?!?" (Democrat) lawyer again tells him not to answer. Note: If the answer to this question is "no," then it's an easy one to answer. "Are you the source of information in this report?!?" "You made that tip to child services in an effort to give Charlie Geren's campaign a political advantage." "It's fair to say, you were eager for Representative Geren's campaign to prevail." "It's fair to say you were invested in the outcome of the campaign." "You badly wanted Mr. Geren to win."